Power tilt-in-space adjustable shower commode chair. 330 lb weight capacity. The Ocean E-VIP, an electronically height adjustable, tilt-in-space shower commode chair was designed with the caregiver in mind. Designed to alleviate lifting and back strain. The E-VIP has a seating system mounted to an electronically height-adjustable wheeled chassis. For all your hygiene needs, it rolls over a commode or into a shower. The seat rises to 41" with a remote control. With the same ease, the remote controls the tilt angle of the seat. The patient is placed at a height or angle best suited for the necessary care. There are plenty of positioning adjustments made with the seat, head and foot rests. All this movement is done with minimal effort from the caregiver. It is suitable for use in large bathrooms, in the home and institutional uses. The frame is constructed from stainless steel, aluminum or plastics to achieve a corrosion free product. The electric components are sealed allowing the chair to be cleaned or disinfected by commercial cleaning methods. Recharging can be done on the chair, or when used in shower rooms, the battery case can be removed and recharged off the chair. Available Accessories: Padded Chest Strap, Padded Lap Belt, Safety Harness, Calf Strap, Soft Seat Overlay, Action Gel Seat, Splash Guard, Solid Insert, Side Laterals, Arm Support Pads, Safety Support Bar, Soft Seat Overlay, Arm Width Extender, Arm Lock, Calf Support, Amputee Support, see below. 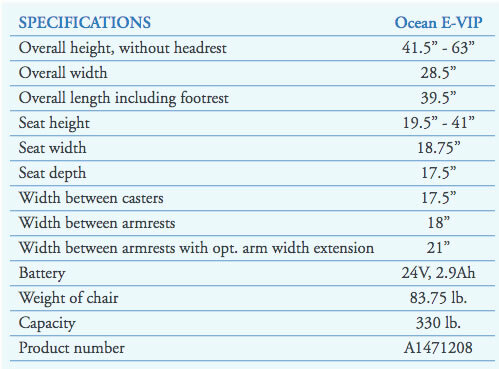 Overall length including footrest, 39.5"